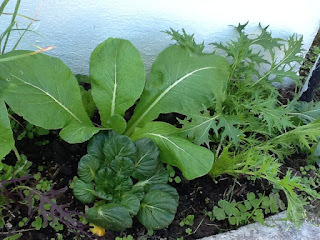 Notes on my vegetable growing experiences, recipes etc. From the seed packet or seedling pottle to my tummy via the garden! Growing up in New Zealand in the 1950s, a flan wasn't the fluted tart thing that we know now, it had a sort of sponge case, and my Mum regularly made one for Sunday lunch. I've recently pulled out the Tala brand flan tin she gave me when she was downsizing her kitchen gear some years ago, and decided to have a try at making one from her recipe. Cream butter and sugar, gradually add eggs previously beaten together, add the warm water, then gently fold in the flour. Bake 25 minutes at 170 degrees. Allow to sit for 2 minutes when removed from the oven, then turn out. Out of the oven, and turned out, this is the cooked flan shell. In the background is the "Tala" flan tin showing what it looks like on the side that you put the the mixture in. Heat milk until almost boiling. Beat yolks and sugar in bowl over boiling water. Stir in flour. Pour hot milk over eggs, stirring all the time. Cook until flour is cooked, add rind and salt, and as much lemon juice as is necessary for taste and texture. Pour into flan case. Meringue – Beat the 2 egg whites till thick. Add 90g sugar in the last stages, gradually, continue whisking until stiff. Pile meringue on top of flan, making sure it comes right to the edges. Dust with sugar. Bake 170º ten minutes, keeping a close watch on the colouring. I have just netted my Satsuma Plum Tree. I can say that pretty quickly, but it was two hours of ladder shifting and climbing, stretching my arms and the netting only to find my arms weren't long enough and the netting was snagged on twigs. Down again, and unhooking the netting (which I sewed into a sort of tent shape last year) and trying again from a different part of the tree. I had laid the netting on the ground and thought I could just sort of pull it up... er no, not that simple. 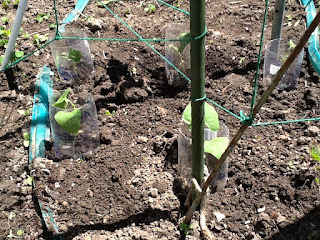 And the tree has grown since last year, so I ended up using the vineyard trick of clipping netting together with the tags from the necks of bags of bread - I added a length of grapevine netting to make it long enough to pull together at the bottom. Then I threaded through some oldish elastic - it still had stretch, but I wouldn't use it to keep my knickers up! 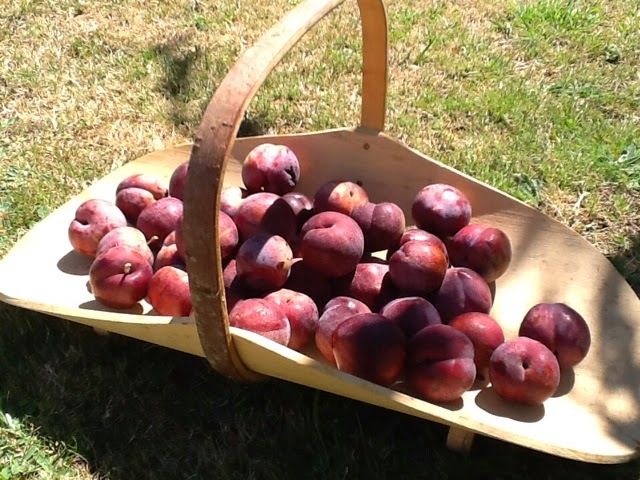 - and finally my clothes peg trick to keep the birds out and to give me an easy access to the plums when they are ripe, and I shake the tree and they fall into the net. 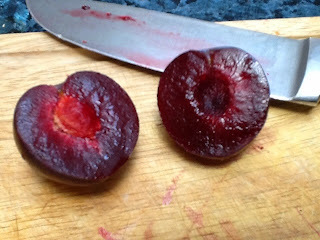 The tree was a gift in 2009, it's a beautiful tree with delicious Satsuma plums, and if I don't go to this trouble, the birds strip it of plums. I'm pretty sure I won't be wanting to tackle physical work for a couple of hours, but I am very proud of myself. Pai te mahi Kuia indeed! Twelve days out from Christmas, and time to ice the Christmas cake. 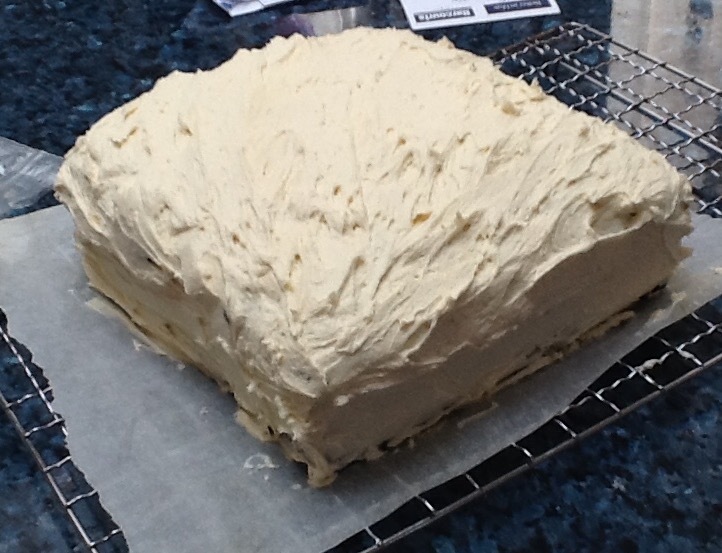 I've been feeding it brandy for the last couple of months, and it's getting iced with a lovely Brandy Butter icing. Cream butter and sifted icing sugar, add brandy and vanilla. Beat well. Will keep. It's the only Christmas cake icing I ever use, it's yummy, it's quick and easy, it's very forgiving and it's very popular! I've spent the morning in the garden, and just had to pick some of these lovely lettuce leaves for lunch - aren't they superb! 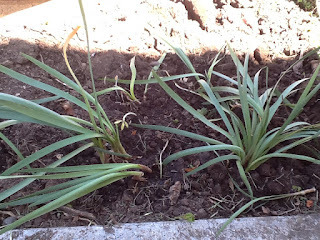 A friend dropped around a clump of garlic chives too, which I've divided up. So yummy with the lettuce! October - time to bake the Christmas Cake! It's a long weekend here in New Zealand, Labour Weekend, commemorating the fight for the right to limit the working day to eight hours - times have changed, and people seem to be limited to 4-5 hours which means they're working several jobs, or are working 12-16 hours... - but anyway, we get one of the best holiday days off, Spring is here, the weather is generally settled (hmmm. It's pouring with rain as I write this!) and we're ready for a short break after winter ills. Here in Hawkes Bay we have a four day break, we take the Friday as our Anniversary Day, making this a just plain awesome opportunity to draw breath, go away or get into the garden etc. It's the time I traditionally make my Christmas cake, which I then feed with brandy (gently spoon brandy over from time to time) until Christmas. I always use Alison Holst's Pineapple Christmas Cake recipe, which I've used for three tiered wedding cakes for each of my daughters as well. Alison Holst has been a inspirational cook and promoter of home cooking almost all of my life. 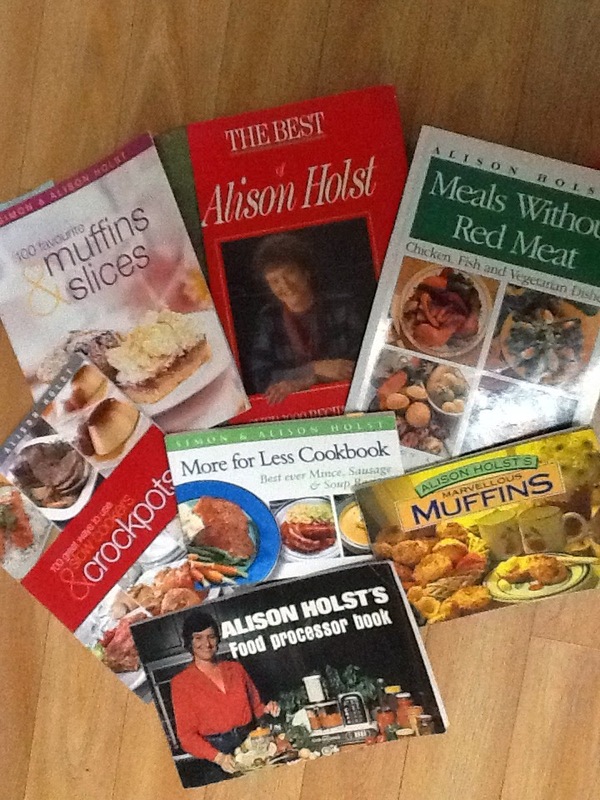 I have many of her cookbooks, and what's more, I USE them! She was a lovely relate able figure on our tv screens, and I watched her in person demonstrate techniques when she travelled around the regions 30 or so years ago. She has made a lasting impression on the way we feed our families here. Line a 23cm tin with one or two layers greaseproof or baking paper. Measure spices and flour into bowl and set aside. Cream butter, sugar and essences until light and fluffy. Add eggs one at a time with a spoonful of flour mixture after each to prevent curdling. Add prepared fruit and pineapple to remaining flour. Add flour and fruit to creamed mixture and mix thoroughly. Press evenly into prepared tin. Use almonds and cherries to decorate top. Bake at 150° for 1 ½ hours, then at 130° for about 2 hours until skewer comes out clean. Sprinkle hot cake with brandy. I love fresh beans! 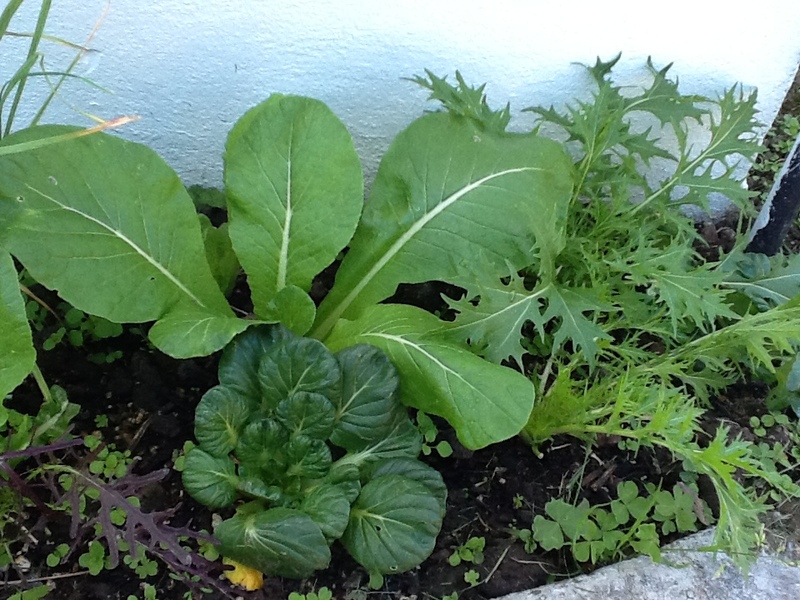 I grow plenty of them in season, eat them lightly cooked - in salads or not - and freeze them for winter. This year I'm planting to have bounty to give away too. I'm recording my second planting - forgot to with my first and they only took about a week to germinate, so are now being planted out. I plant them in seed raising mix for a faster germination. So, day 1, seeds planted. Now if you're sharp-eyed you'll note that these seeds have a "best before" date of January 2012, almost four years ago, but so far they are still giving me a germination rate of 100%. I keep them in the fridge all year, and I have been saving seed year on year and using some from the packet and some I've saved. 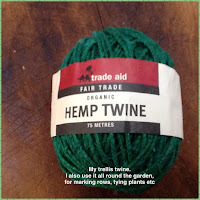 I have to say that this company - and I have no affiliation with them other than as a satisfied customer - have produced awesome seeds. Day 3 - two of the seeds have moved themselves to the surface. This used to greatly bother me, and I have to admit that as a beginner gardener I've even been guilty of pushing them back under soil! Until I realised that the seed is the bit that forms the top and not the roots of the bean!! This bean was planted 18 days ago, and only appeared two days ago, so two weeks before there was any sign of life. 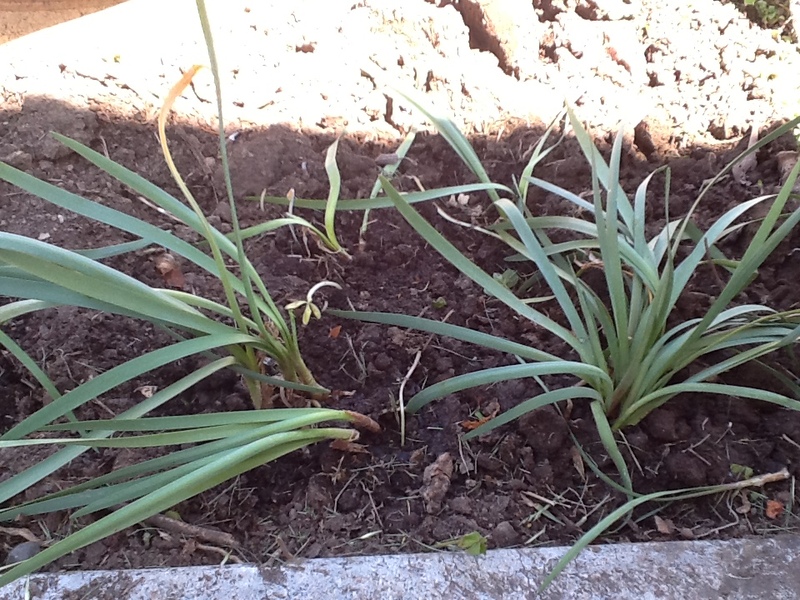 And yes, there are weeds around it, I leave the soil undisturbed when I'm waiting for something to happen! This is the punnet shown above, but from the opposite side, and all six are now visible, with two very hungry to see the world! 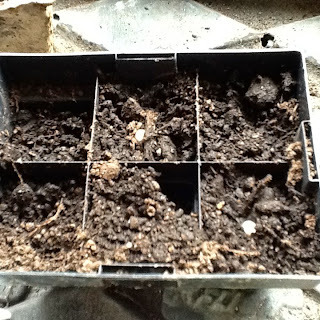 These are now seven days since seed sowing. I've erected a bean frame, every year I put together posts and poles and use twine to make a seasonal frame, as I don't have a permanent one. 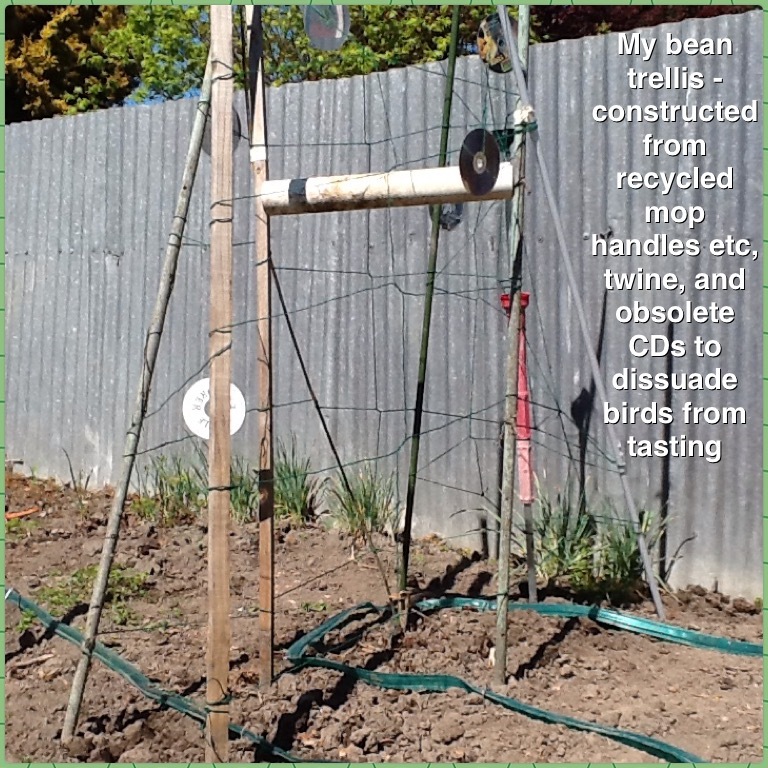 This works very well, and means I can rotate where the beans grow in the garden from year to year. It looks a bit hillbilly at the moment, but once the beans start covering it, it won't look nearly as bad! So here we have Day 18 of the indoor planted beans, and Day 25 of the outdoor ones. 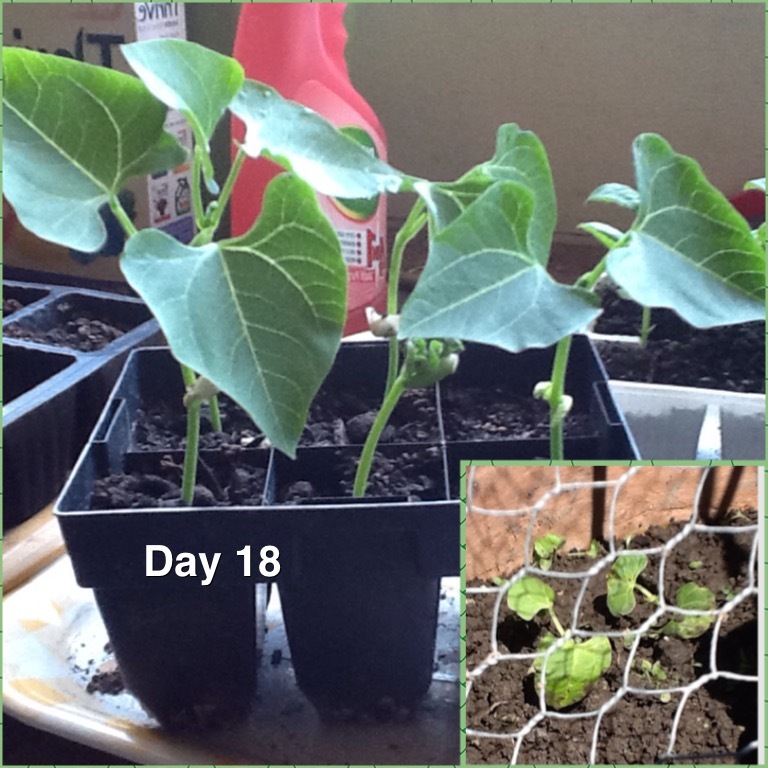 The indoor ones are twice as tall, and working on their next pair of leaves. 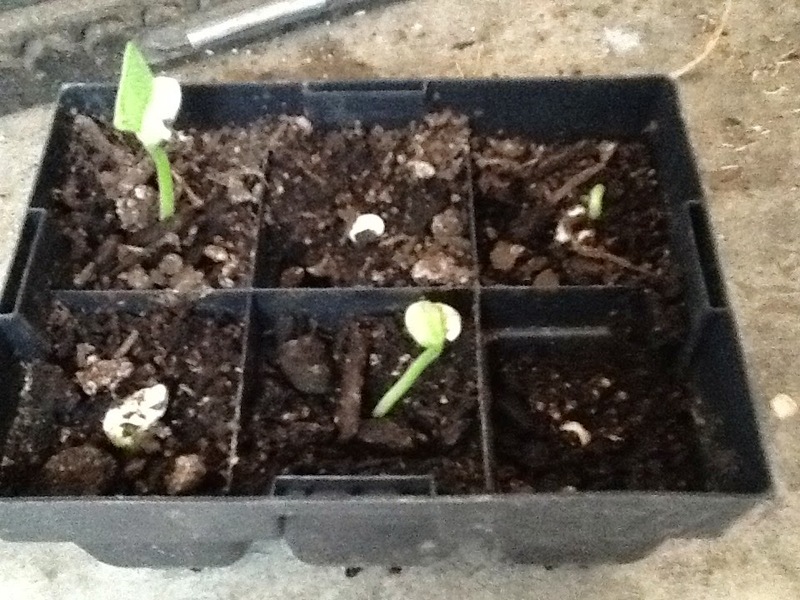 One has decided the world is too hard, so I'm likely to be planting out five of the six original seeds as plants. The outdoor ones have had six of the seven germinate. 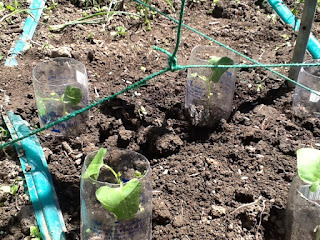 Day 25, one week later than above, and today I've planted them out under my bean frame trellis thing. I cover them with see through sleeves (from organic milk containers!) to stop the birds pecking and the snails having a feast. They can't stay in these forever though, and they don't really develop a strong enough stem until I take them off - they need to learn to stand on their own feet as it were! And now, here we are, three months after first planting the seeds with beans being picked every day. I picked the first ones about three weeks ago, this is a photo of today's pic. I love the long round smooth pods of the Blue Lake Beans! This post should have been written in June, but I got sidetracked by my mother's failing health and subsequent death. But it was due to her that I had such success with my lime tree for the very first time. 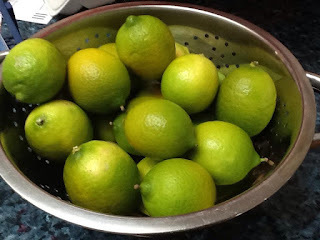 Seriously, I'd despaired of ever getting limes from my tree, but when we cleared out her house and shed, I came across a bag of citrus food, which I promptly claimed ahead of my siblings, and spread generously around my lemon, lime and mandarin trees. Aren't they gorgeous? I ended up making the most delicious lime chutney, which is amazing with cheese and a good cracker. food processor until coarsely chopped. Cook over medium heat for 2-3 minutes or until very aromatic. warm sterilized jars and seal. 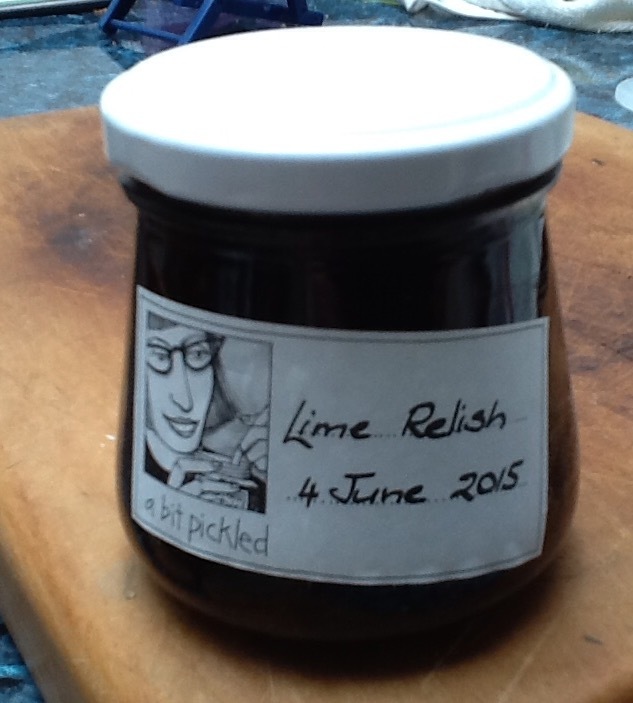 Makes about 8-9 small jars. Librarian, home gardener, greenie, passionate about human and civil rights, and just downright fairness.